A good place to sit! 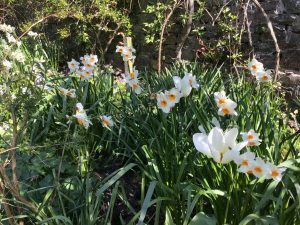 This is one of the loveliest times of the year at Hartland Abbey, not only to visit the gardens but to work in them too. Everything is exploding with fresh leaves, colour and scent. Every moment brings another surprise. So much has changed in the past fortnight! Gone are the cold winds and rain which bedevilled us for such a long time to be replaced by warm, spring sun. 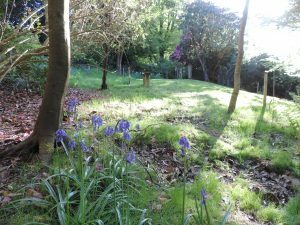 The bluebells, due to the cold, have been hanging on for ages and are still lovely in the Shrubbery, which is north facing, but are fading in the other walks, soon to be replaced by plenty of foxgloves, so special to Hartland. 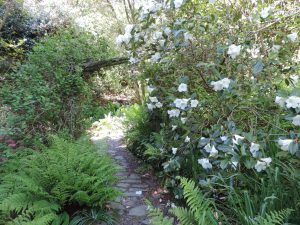 The Bog Garden, the Shrubbery and the Walled Gardens are all bursting into life. Unfortunately weeds grow so fast too so it is the time of the annual battle against nettles, docks and ivy! 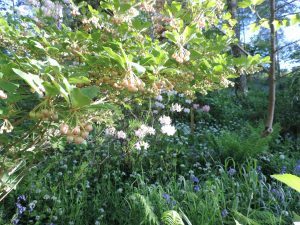 But how wonderful it is at the end of a back breaking day (worse as we get older) to wander peacefully round the gardens and to see old friends flowering again after a year’s absence! 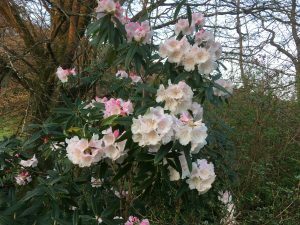 Most young rhododendrons and azaleas will have grown but some poor souls have hated the cold weather. The Hartland Hartbreaker run was a huge success. 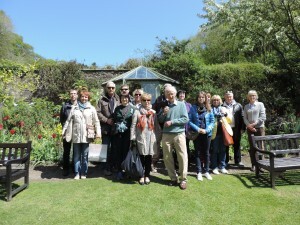 The sun shone and lots of supporters came too and were able to enjoy the good weather and the Abbey gardens. Although the ground was still waterlogged in the fields we managed to park everyone and no-one was stuck at the end! Only a few minor casualties thankfully on the run and a lot of brave people finished the gruelling race in order to raise considerable sums for the Children’s Hospice South West. Well done to everyone and also, especially, to Simon Haywood for his amazing organisation. I believe the next year’s race is already planned for Sunday May 5th 2019! What gluttons for punishment….. The next big event is the Midsummer Charity Weekend on 22nd – 24th June with the Charity Ball on the Friday night, a 50’s Rock n’Roll night on Saturday and a big sporting event on the Sunday. We also have ‘Wuthering Heights’ being performed on the lawn by Hotbuckle Theatre on Sunday evening. So lots going on for everyone! All details are either on our website or on Midsummercharityweekend website. 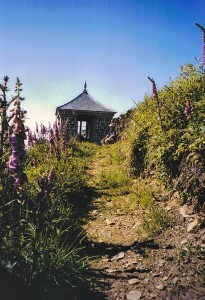 We just hope for some good summer weather as it is all in aid of very special national and local charities. 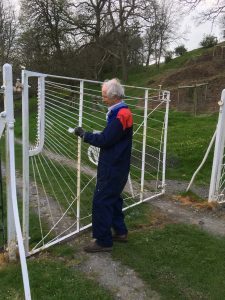 Thankfully Dave, our groundsman who keeps everything looking as smart as we can, is back from a short stint in hospital and is back on the mower and wielding the strimmer again! 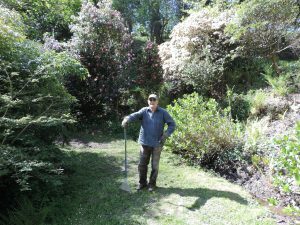 Leighton has been very ingenious and has managed to pull up a tree rhododendron, brought down in the wind and snow, with his old pulley. 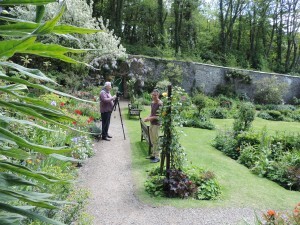 Nigel and Sam have been so busy in the Walled Gardens and greenhouses with hardly a moment to breath. 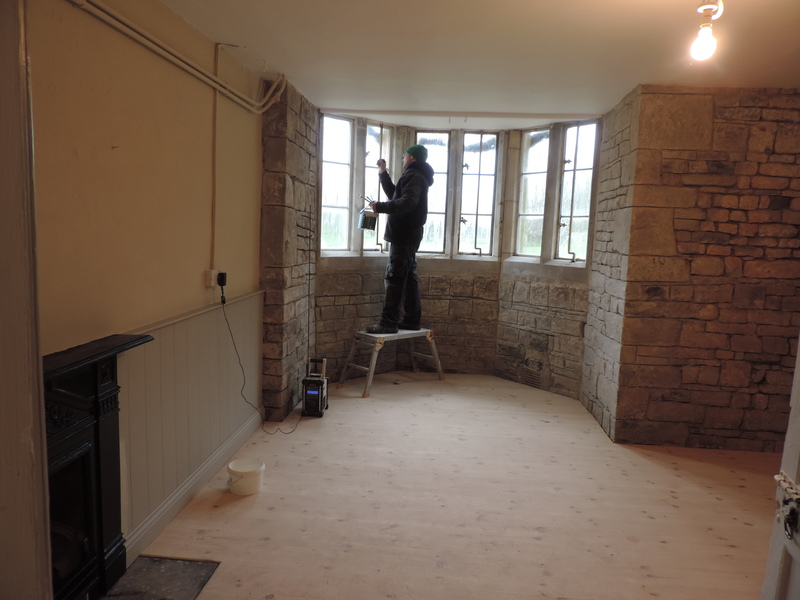 Carol and Anne continue to keep the house spick and span – without all their huge support we would not be able to welcome visitors to Hartland Abbey and we thank them all. Kath and Jo and their helpers are doing a fantastic job providing so much delicious sustenance in the Tea Rooms. 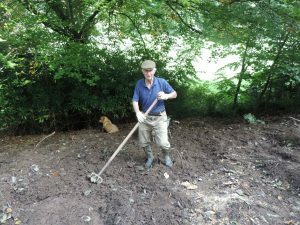 Dave thankfully armed with a rake again! Guernsey at Hartland and Clovelly! We are nearly in May and today the only ray of sunshine is my friend, the Greater Spotted Woodpecker, visiting our bird table! He visits every day and lifts our spirits in the gloom of this April – long gone are those few lovely hot days. 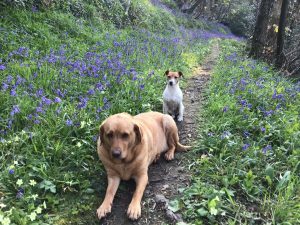 However the bluebells are looking beautiful, the camellias are glowing and the rhododendrons and azalaeas are beginning so spring really is arriving at last. The violets and primroses are the most beautiful ever and really lift the spirits too. 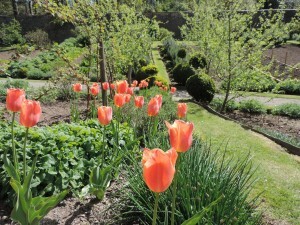 The Walled Gardens are filled with the scent of the ‘Geranium’ narcissi and Brown Sugar tulips. 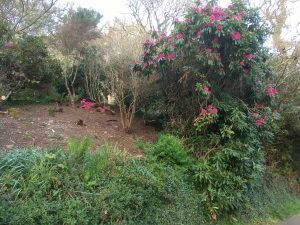 We are doing lots of new planting this spring in the Shrubbery and the Bog Garden. 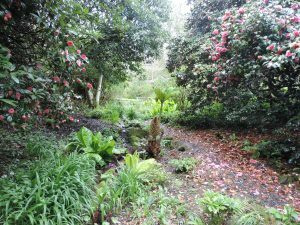 Where we cleared a big area in the Bog Garden in the winter we are planting azaleas and rhododendrons and we are hoping to create a waterfall though this may have to wait until autumn now as it was just too wet earlier on. 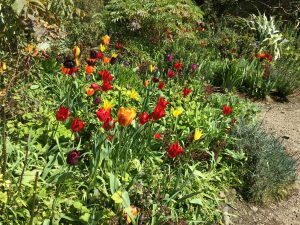 We have just returned from our annual trip to see the wonderful, inspiring Cornish gardens and did our customary shop at Trewithen on the way home. Now there is a car load to plant….a slightly easier plant hunting trip than those endured by the intrepid 19thC planthunters! 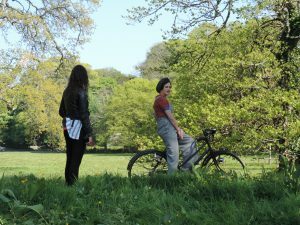 We have just seen the film of ‘The Guernsey Literary and Potato Peel Society’, so beautifully shot on the Hartland Abbey estate and at nearby Clovelly last May. 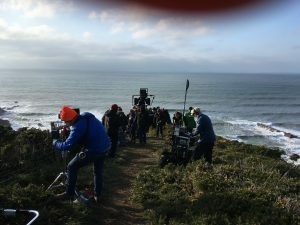 We were amused to read and see so much about the beautiful Guernsey countryside where it was set; in fact nearly all the countryside and seaside scenes in the film were shot in beautiful North Devon, much of it at Hartland and Clovelly! It is a lovely film from the book of the same name, by Mary Anne Schaffer and Annie Barrows, her niece. 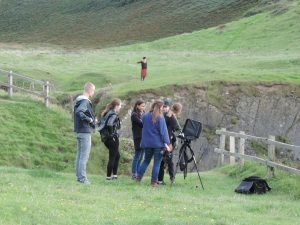 It was a real honour to have been chosen as a location and thank you to the cameramen for depicting Hartland so beautifully. To see Clovelly as St Peter Port, Guernsey was a real triumph of modern technology! The ‘Peabodies’ as we call them have all grown enormously and ‘Pike’, the eldest, has been showing off his new tail incessantly – he is so proud of it. The girls are looking rather bored of him but Spring is very much in the Peacock air and we hope for more chicks this year as long as we can defeat the foxes and badgers who sadly love eating peacocks in any form. The Peabodies love our visitors and any left-over scones or bread are always welcome! 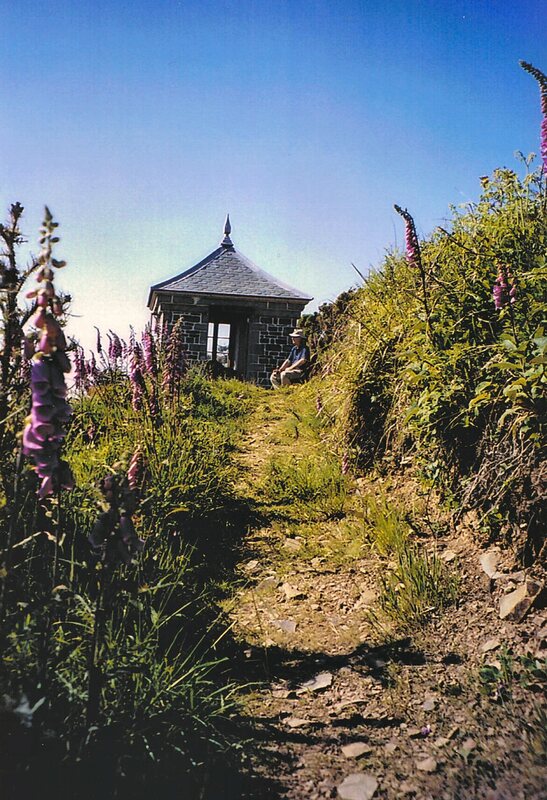 It won’t be long until our outdoor theatre season starts on 24th June with Wuthering Heights by Hotbuckle Theatre. This year we are lucky to be having Amy Lythgoe-Jones of @Hartland Point doing a proper barbecue for us. We will be able to buy food before the start and during the interval of performances. We will be having our usual Wine and Pimms Bar in our ageing tent! Lets hope for a proper summer when we can all relax with our glasses of wine or Pimms on a beautiful summer evening watching some of these marvellous performances. All the details are on our Outdoor Theatre page. 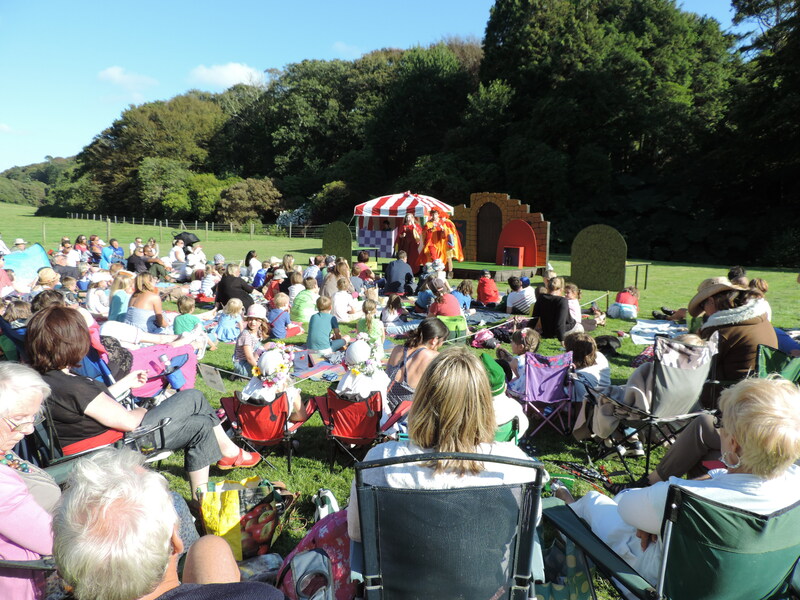 Thank you again to Richard Wolfenden-Brown and The Plough Arts Centre for booking these wonderful travelling theatre companies to come to the lawns of Hartland Abbey and keep us all entertained. A German Officer at Hartland Abbey! 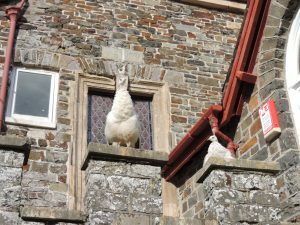 When the Beast doth blow….. but happily Easter is now arriving at Hartland Abbey! 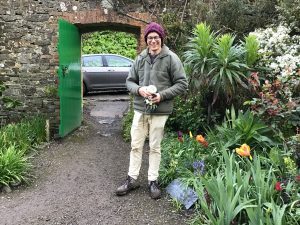 Instead of decorating the Abbey with huge vases of camellias and narcissi and putting all the Quiz questions around the gardens ready for Daffodil Day on 18th March, I was at my desk cancelling it in all the ways available to us – wonderful Radio Devon, on our website, social media and word of mouth. Hopefully the wonders of modern technology worked as we couldn’t bear to think of hardy folk turning up only to find the gates closed. The weather forecast was just too bad with snow and cold winds from the east AGAIN; the car park was anyway almost waterlogged (and frozen)! 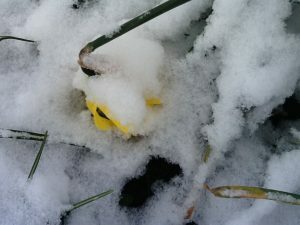 The daffodils were hanging their heads in rather a depressed way so with all this we took the decision to cancel. Only once since 1996 have we cancelled anything before – a waterlogged Snowdrop Sunday many years ago. We are not quitters but we really felt it was the right decision; as it was we were totally vindicated as Sunday was horrendous with a lot of snow for Hartland, drifts on the A39 and roads closed everywhere. 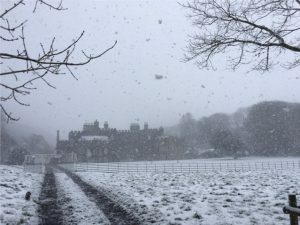 We have postponed until next Sunday 25th March when hopefully everything will be looking more beautiful and something called SPRING will have arrived with the cold winds from Russia a distant memory! 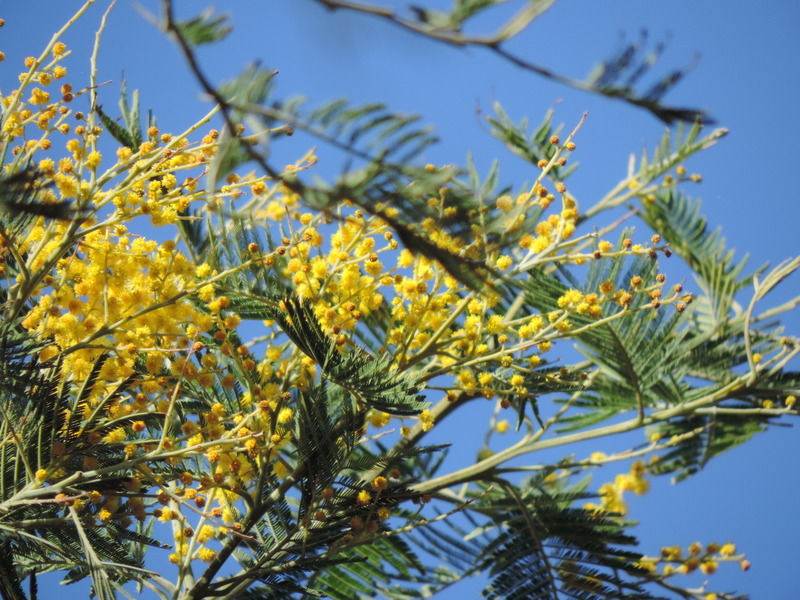 The mimosa in The Bog Garden is really beautiful, the camellias are gallantly flowering in full profusion and the orchard is a golden carpet of daffodils. Delicious warming food will be on offer in the Tea Room; poor Kath and Jo wasted so much last weekend. So much has been achieved this winter by our small team despite endless flu and colds. Richard, our two-day-a-week decorator and miracle builder, was off for two weeks with a stinker but nevertheless has done wonders! New fire doors have had to go in which we did not want but Fire regs are Fire regs these days. We hated the idea but the house is much warmer as they have stopped the worst of the draughts! He has painted the exhibition passage, the Tea Rooms and the Ladies loos so all will be looking fresh for the new season. And the really good news is the NEW CARPETS! We have not had a new carpet almost since the War! 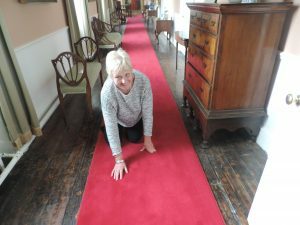 But now wonderful Braddicks of Bideford have laid the most beautiful, paeony red carpet all the way up the front stairs, along the landing and down the back stairs. Our visitors had been commenting on thread-bare carpets, something that we had hardly noticed! But now it all looks so smart – we are so thrilled! Carol spends the winter spring cleaning, dressed in about two coats and a woolly hat to keep warm in the house! She had a nasty fright one morning when she met ‘The Beast from the East’ coming into the Front Hall, under the door! 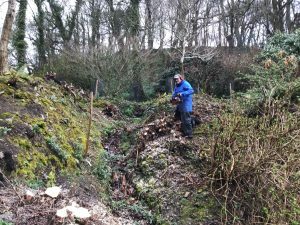 Dave and Leighton have spent most of the winter sawing up fallen trees from many of the awful gales that have been so prevalent this winter. 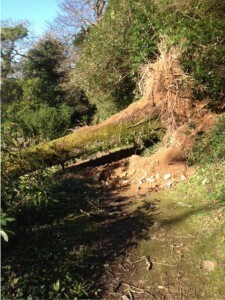 We have also had to have tree surgeons cutting off unsafe branches from many of the old trees near the paths and walks. All money out unfortunately….! But we will have plenty of logs! I am afraid there is still a mess to clear up but Rome wasn’t built in a day! 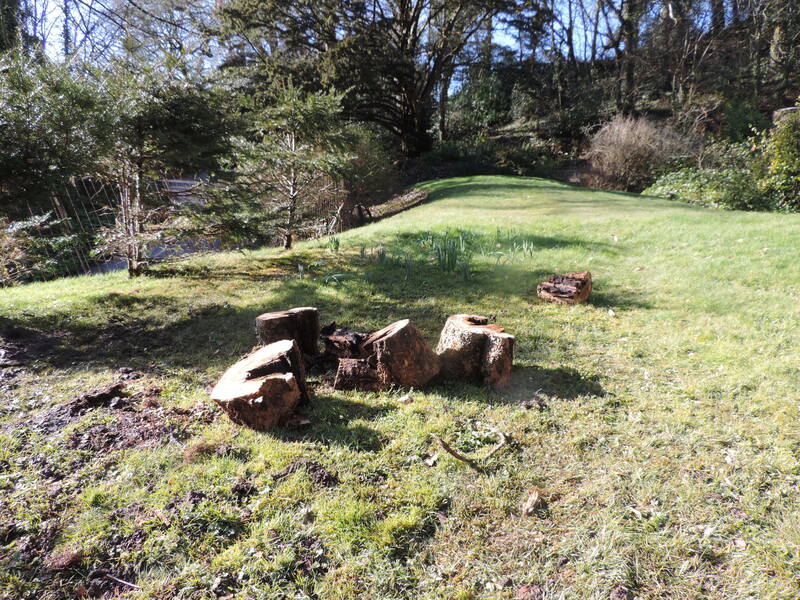 We thank everyone – Nigel, Sam, Dave and Leighton for their fantastic work in the garden all through this awful winter. Theresa for her sterling administrative work and Carol and Anne in the house. Ellie doing social media. Thank you all and everyone else who supports us in every way. 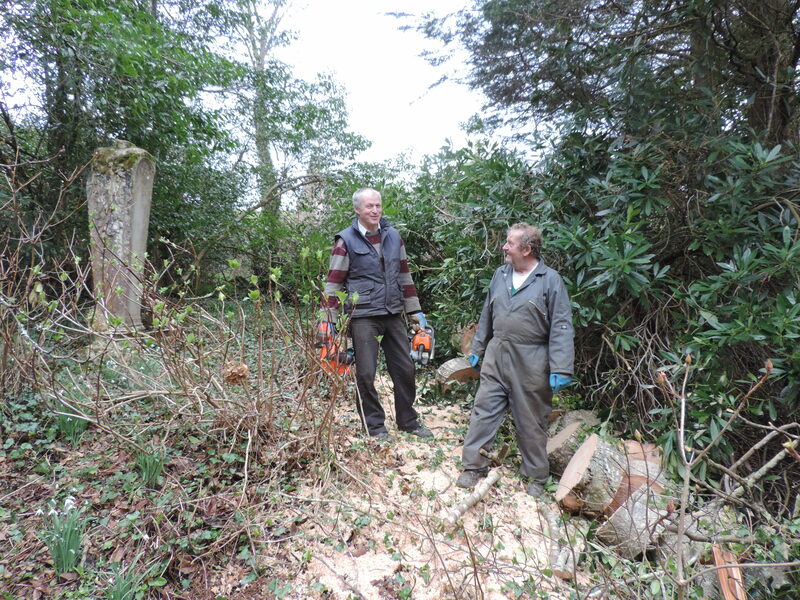 We had great fun in the autumn clearing two overgrown parts of the garden. 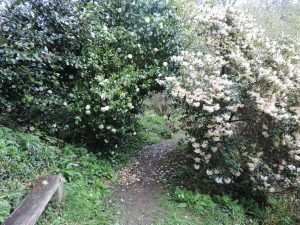 A massive tryffid had taken over a part of the Shrubbery and bramble and ivy of Himalayan proportions had taken over the wall at the Top of the Bog Garden. Clearing things at Hartland is always risky and of course the Atlantic winds found a new way in and brought more trees down! 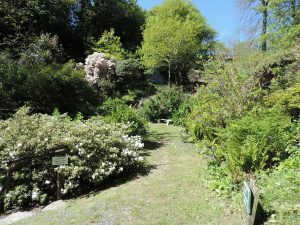 But ‘The Glade’ is already looking lovely and hopefully all the newly planted rhododendrons and azaleas will flower. It should make a lovely, warm place to sit. The grass surprisingly has germinated in the winter and is still alive after the freeze-ups. 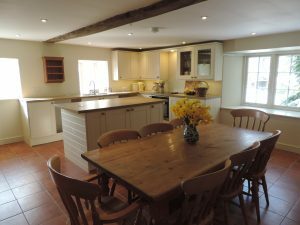 We have been very busy getting our new holiday let ready for 2018. 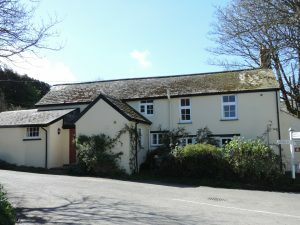 Affeton Barton had been the Home Farmhouse for centuries and latterly, for the past forty years, home to our shepherd. 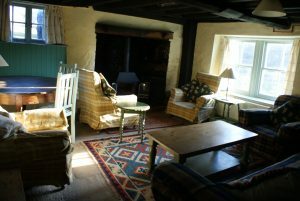 When he died two years ago we decided to bring it into the 21st century and it is now a really comfortable place to stay. It has all the advantages of the beautiful Affeton estate with wonderful walking, fishing, bicycling, swimming and a hard tennis court. 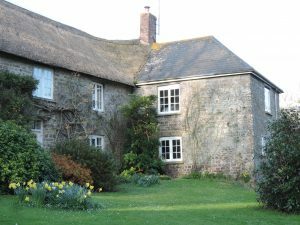 It is in spectacular, rolling country between Exmoor and Dartmoor, a world away from the rush of modern living but with all mod cons! 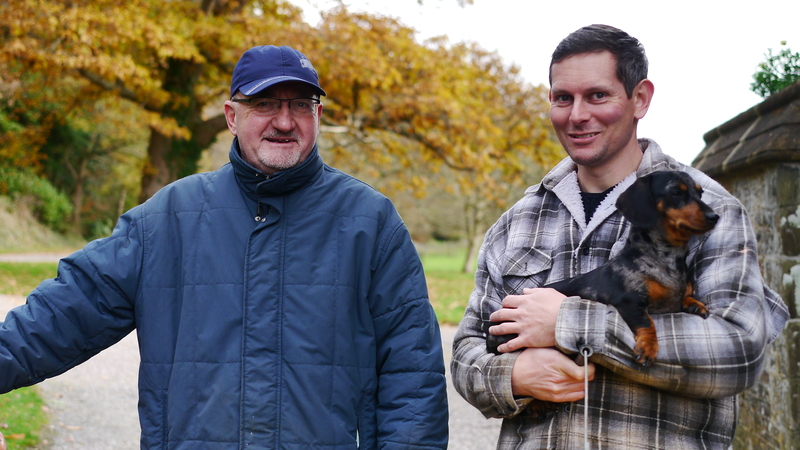 Peter and Kieren, two of our fantastic house stewards, have, during the winter put together a really special visual history of the Abbey and the estate for all to see. It is so kind of them and will be such a bonus to visitors. Theresa, our Administrator, has been reading through old family diaries and has found one on Sir George and Lady Stucley’s honeymoon in the late 1800s. It is going to be displayed later in the season and is a fabulous account of travels in Europe at this time with some hilarious sketches. We are all looking forward to ‘The Guernsey Literary and Potato Peel Pie Society’ being released in the cinemas on April 20th. Partly filmed on the Hartland Abbey estate in May 2017, it stars Lily James, Micheal Huisman, Jessica Brown-Finlay, Tom Courtenay and Penelope Wilton. 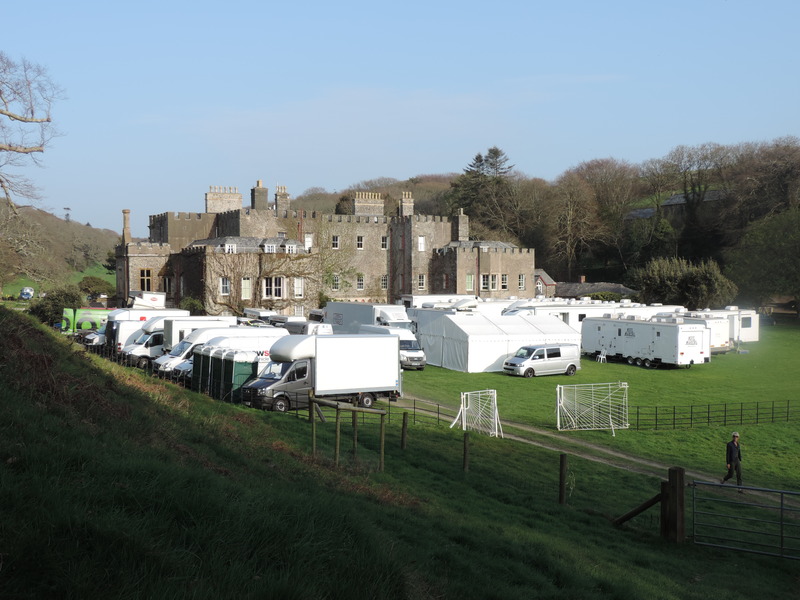 We think it is going to be a wonderful film set in some stunning North Devon scenery. Having watched some of the very realistic filming, Guernsey must have been a terrifying place to have been in the War. 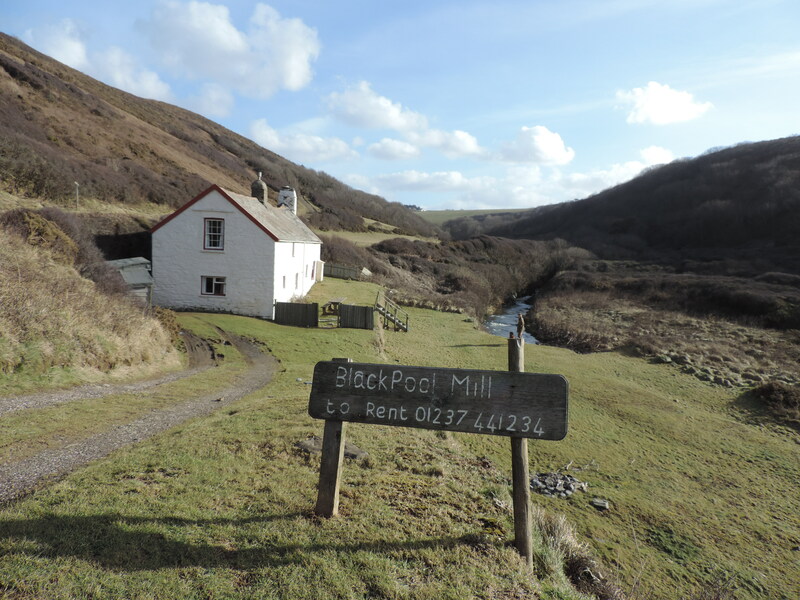 Also filmed at Hartland, in and around Blackpool Mill Cottage last year, is a short film which has just come out called ‘Between a Rock and a Hard Place’. Produced by Alastair Gourlay, it stars Clive Russell of ‘Game of Thrones’ fame. Poor things had the most awful weather to film in and the place became a mud bath. They worked so hard and we wish them every success. 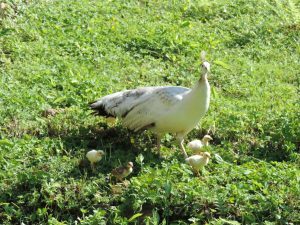 Last summer Marjorie, our peahen, hatched six chicks. The previous summer she had hatched only one, Pike, her adoring son! Happily, so far, these chicks have survived the winter and are now her adolescent children! A fox was seen in the snow this week so we are hoping for the best. 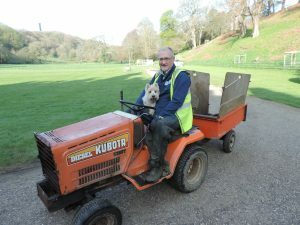 Sadly in 2017 Dave and Carol lost their adorable Westie, Holly, such a character and so popular with all our visitors, always seen riding the lawnmower with Dave. She is missed hugely by us all and our visitors. She was a big part of the Abbey team! Carol admiring the beautiful new carpet! 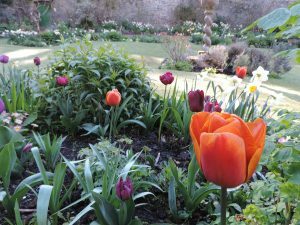 Bluebells, tulips and Easter eggs have arrived at Hartland Abbey! 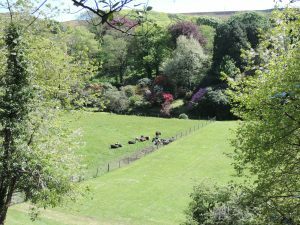 It is only early April but things are really stirring in the valley at Hartland Abbey! 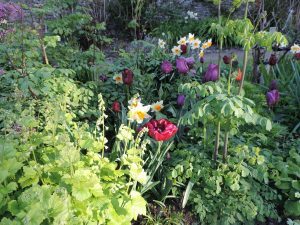 The daffodils and narcissi have been better than we have ever seen but are almost over now except the deliciously scented ‘Geranium’, one of the latest of all. 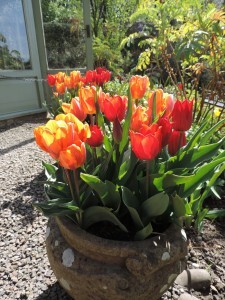 The tulips in the Walled Gardens and all the pots around are bursting into flower in the most glorious riot of colours. 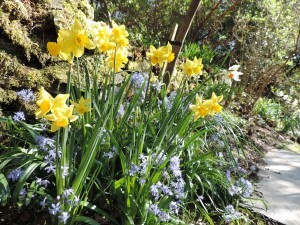 Just as, sadly, the narcissi are fading new life is erupting to put on a show of glittering, jewel-like beauty! They are so early I worry how long they will be with us in this glorious, summery weather. 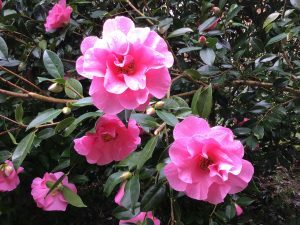 The camellias too are putting on a fantastic display with some huge heads on the later ones above the Fernery. We have cleared some ponticum so that they are easier to see. 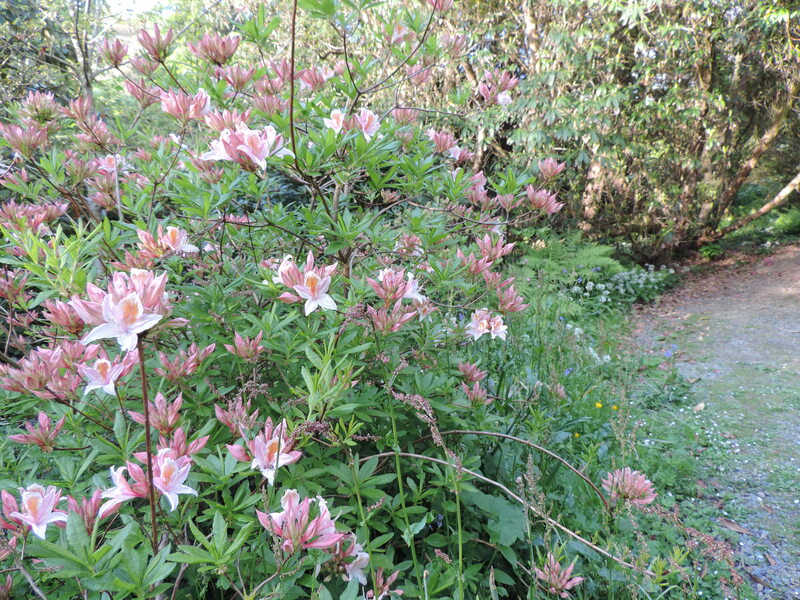 The azaleas and rhododendrons are all coming out in the Bog Garden; the Shrubbery hopefully will be a little later. 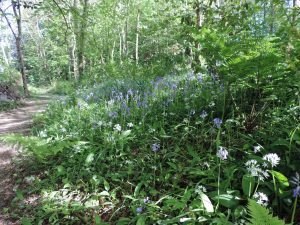 The bluebells have burst forth too and the valley is turning bright blue again. 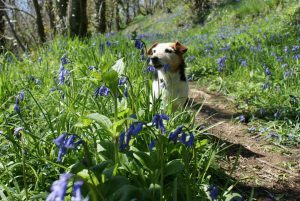 Violets, primroses and wild anemones accompany them and the gorse and blackthorn on the steep slopes above Blackpool Mill Cottage are a wonderful sight. It is such a great time of year to visit Hartland Abbey! 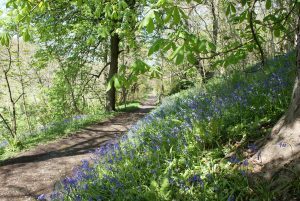 Our visitors are telling us how beautiful the bluebells are looking now – just the right time for a wonderful Easter display. Easter eggs are in the larder keeping cool, all ready for our Easter Egg Hunts on Easter Sunday and Monday! It is so difficult to know how many to order as we have no idea yet what the weather will be! But hopefully we have enough for all the children who so love the fun of Easter! 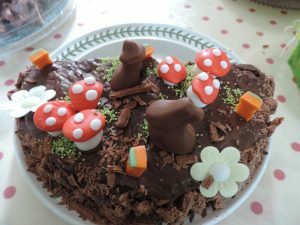 Kath and Jo will be cooking up some special Easter treats in the Tea Room. They are always look so tempting and are so delicious they are hard to resist! 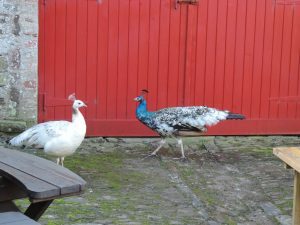 Marjorie, our white peahen, and her son, Malcolm, love being around our visitors and are always grateful for crumbs under the outside tables. Malcolm is growing a tail of which he is immensely proud! 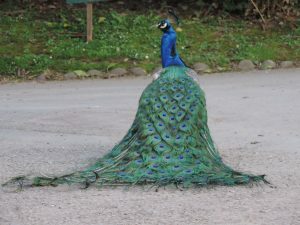 But every time I try to photograph him when he is strutting his stuff he becomes very embarrassed and puts it down. So if anyone can get a good photo we would love to see it! 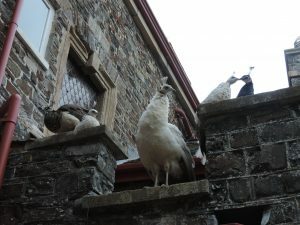 Hopefully Marjorie will sit again this spring and perhaps produce more than one chick, and a girl would be very welcome! Blackpool Mill Cottage and The Bear have both been spring cleaned, painted and in The Bear smart new lamps in the Sitting Room and the main bedroom look really good. There is a busy season ahead so it is so important that everything is spick and span now. We look forward to welcoming guests throughout the summer. 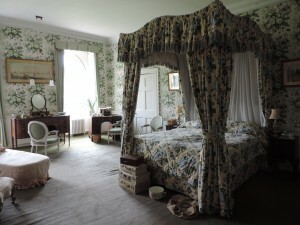 All the family will be with us for Easter so there is a lot of bedmaking and cooking going on! Our dear Scudamore granddaughters had the time of their life at Aintree yesterday when Lucinda Russell, partner of their paternal grandfather, Peter Scudamore, trained ‘One for Arthur’, winner of this year’s Grand National and they were lucky enough to be included at the prizegiving, a moment they will never forget! Carol, Hartland Abbey housekeeper, with the Gold Award in 2016! Putting up the weird tent on the Warren! 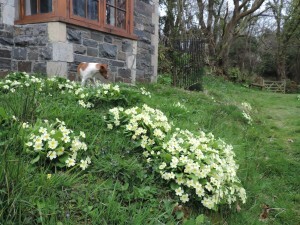 The primroses will be out too! 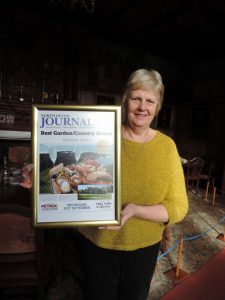 A bad cold and horrid weather is a good moment to update the Hartland Abbey blog, well overdue after a busy 2016 which culminated in a proud moment for us when, in October, we won The North Devon Journal Gold Award for the best Country House and/or Garden in North Devon. It was a hugely proud moment for us at the Award Ceremony at the Barnstaple Hotel. To us this award is a recognition of the hard work by our small team who do so much to look after the house and gardens, provide delicious refreshments, look after our visitors and do their best to give everyone the best possible experience. We are so grateful to all our staff and room stewards. Theresa, our administrator, puts every ounce of her energy into looking after the coach parties and individual visitors to make sure everyone, even the least mobile, have an enjoyable time. 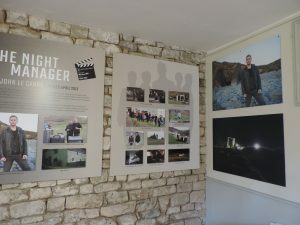 The interest generated from BBC’s ‘The Night Manager’ resulted in a huge number of people visiting the Abbey and walking down to Blackpool Mill cottage where it was filmed. We were thrilled that it won three Golden Globe awards; we were certainly gripped by it! Much to our surprise the autumn was also very busy with the media. Marks and Spencer chose the Hartland Abbey Estate to shoot their online autumn catalogue. The rusty hues of autumn in the stunning scenery provided a great backdrop for their very stylish clothes. 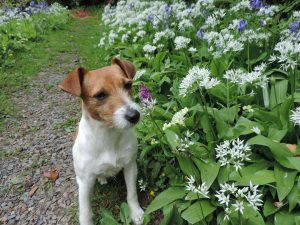 Even Rosie, our terrier, managed to get herself into some pictures! The production team stayed at Hartland Quay; Blackpool Mill and Spekes valley were the locations. Following this Blackpool Mill cottage was used again as a film location, this time for an online, short 45 minute film. 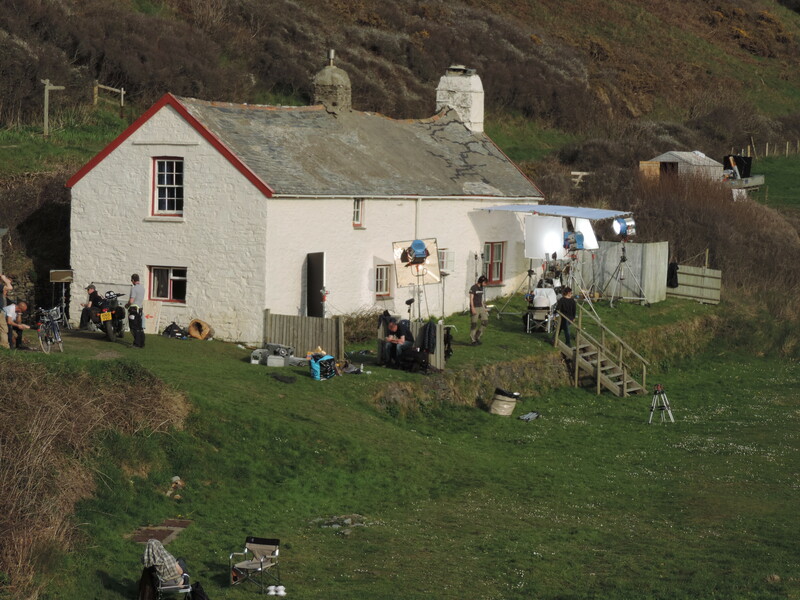 The cottage had been painted in the summer and was looking particularly smart, that is until the film company, on purpose, ‘mucked it up’! Oh dear, we could have cried! Our beautiful cottage was surrounded by heaps of junk, the outside walls were covered in grime, and it looked disgusting, in and out, with some very good special effects from the art department! 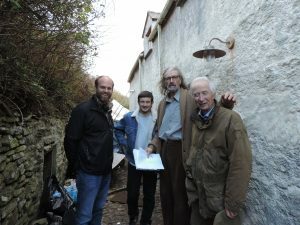 Having read the plot, ‘Between a Rock and a Hard Place’, produced by Alastair Gourlay of Park Drive Productions and starring Clive Russell of ‘Game of Thrones’ fame, promises to be a gripping production. They were a lovely production team and we wish them every success when the film comes out online. The cottage is almost back to normal..! BBC’s ‘Escape to the Country’ was filmed with us in the autumn. 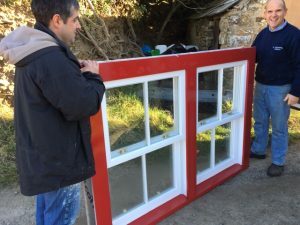 A couple were looking to buy a house locally and they were brought to see a local attraction. Hopefully the photography will be good. 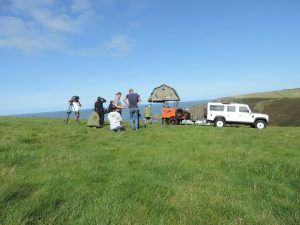 Prior to this an eccentric Channel 4 pilot production, starring Adam Buxton, chose The Warren, above Hartland Quay, to shoot something on camping in a new fangled tent that lies on top of your car! I watched for a bit only to see Adam and the crew becoming more and more confused as to how to put this thing up! It certainly wouldn’t have survived a stormy night! 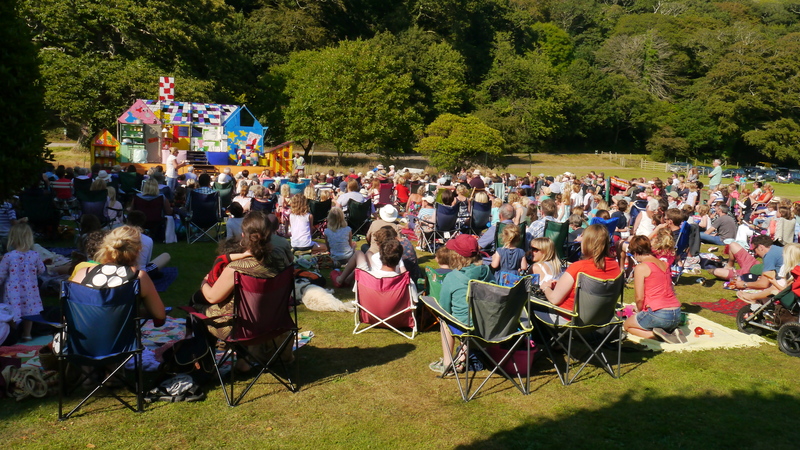 Our outdoor theatre productions, in conjunction with The Plough Arts Centre, were a huge success with Hartland Abbey gaining the largest audiences in North Devon. And we stayed dry! 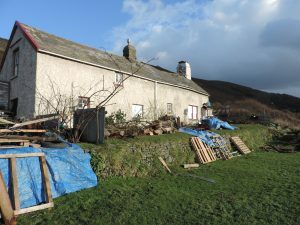 We have gained a reputation as a good ‘stage’, against the backdrop of the house, (also a shelter from the worst weather!) with diverse productions suiting all ages and tastes. With our bar and barbecue, free entry to the beautiful grounds a couple of hours before the start, it makes a lovely, relaxing treat. This summer we have some really exciting productions coming to entertain us all, which you will find on our ‘Events’ page. Sadly Mr and Mrs Crackling, barbecuers for the last five years, have hung up their trotters and we are looking for new people to provide a really good barbecue. If you are interested please contact us. 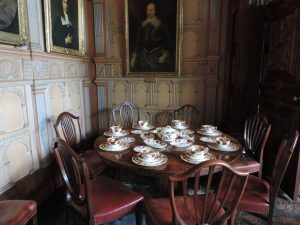 We were very fortunate to be contacted by a local couple, Alan and Pauline Whittle, who wanted to donate their huge collection of ‘Lady Hamilton’ porcelain to us to display. This china has been much appreciated by our visitors and we owe them a debt of gratitude. 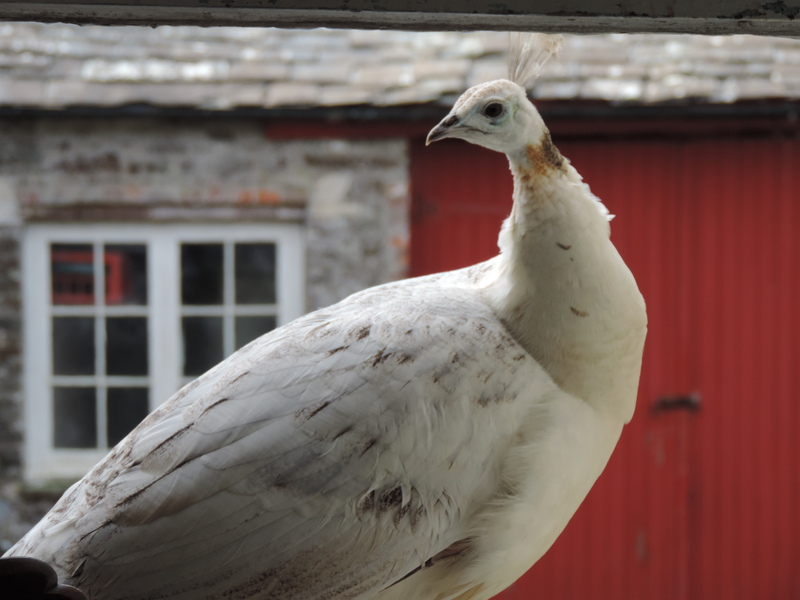 We had a lovely birth in the summer when Marjorie, our only, white, peahen, hatched a solitary egg. A tiny white chick emerged. Hoping for a girl, of course it was a boy! 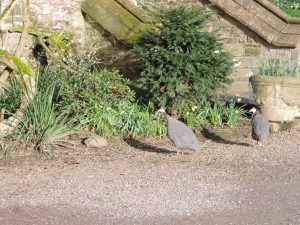 They are inseparable and we pray they survive our fox problem; foxes have eaten nearly all our other peafowl. Originally eleven, now only four survive. The Library has had new chair covers, making it look very smart – the old ones were worn out! Richard Johns and Leighton Jeffery, our maintenance team have worked so hard this year. 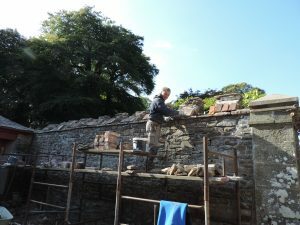 The wall and the old, mediaeval roof in the Courtyard have been restored; the Piggery wall has had all the ivy removed and the walls capped with beach stones. Fire doors have had to be put in in three places. This has saddened us as we feel that with an old house like Hartland Abbey anything modern looks totally out of place. But it will help to put our minds at rest as the fire at Clandon House completely gutted the house and everything was lost, something every historic house owner dreads. But we will now be able to open the downstair passage to visitors before the house itself opens, enabling visitors to see most of the exhibition areas from 11am. On wet days this could be a huge bonus. In summer 2016 we opened two new exhibitions in the old Housekeeper’s Room, last used during the war and since fallen into decay. 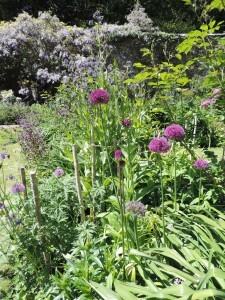 This has made a wonderful, light exhibition space, open from 11am as part of the garden ticket. 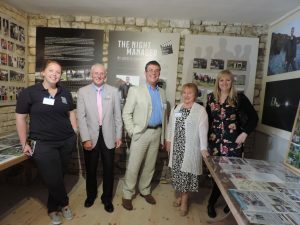 Two displays, ‘The History of the Hartland Abbey Estate’ and ‘ Filming on the Hartland Abbey Estate since 1934’ are proving popular and well received on wet days! 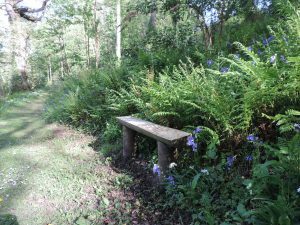 We were very fortunate to have been partially grant funded by the AONB in this project and we thank them for their generous support. I would particularly like to thank Gigha Klinkenborg and Dave Edgecombe of the AONB for their support and encouragement for our project. Christmas was a lovely family time when we were all together without the worry of day to day work. The grandchildren are all growing so fast that we are being dwarfed already! My mother celebrated her 95th birthday very lately; she is an amazing person who still has vivid memories of her part she played as an officer in the WRNS in the War, in Harwich, Gibraltar, Algiers and Naples, for which she was decorated, as was my father for his part at El Alamein, now sadly dead for almost 25 years. 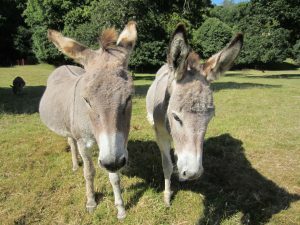 Bluebell and Snowdrop, the donkeys are wintering well at the farm with their old horse friend! They have a lovely shed, deep in straw, which they almost never go into, preferring to get thoroughly soaked instead! They also live with the black sheep, bantams and chickens in a beautiful part of Devon overlooking Dartmoor and Exmoor from their fields! Not a bad life….. Soon they will return to Hartland to entertain our visitors. 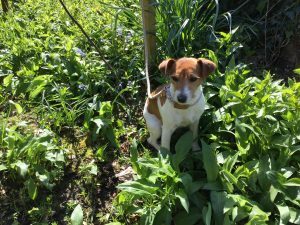 We are hoping to find a husband for them very soon but we only want a small, beautiful chap so if you know one please let us know! Hopefully Tony will be back to welcome everybody! Come to our Daffodil Sunday! the arrival of Storm Imogen on the Sunday. The waves at Hartland Quay were massive but thankfully the hotel emerged unscathed. Imogen hit us really hard on February 7th and 8th bringing down old oak trees, blocking the front drive and the Ladies Walk completely. 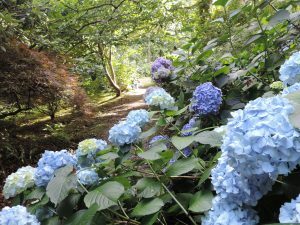 We had lost a huge, old sycamore earlier in the winter in the Shrubbery which provided wonderful shade to the hydrangeas. It was particularly beautiful with a mass of harts tongue ferns growing from its huge, old branches. 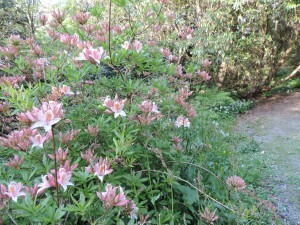 It is so sad; its loss has ruined a part of the garden and as ever, hugely expensive to get cut up and removed. But life has to go on…..
covering all the filming including ‘Water’ with Michael Caine, Billy Connolly and Leonard Rossiter, ‘An Element of Doubt’ with Nigel Havers and Gina McKee, ‘The Shout’ with Alan Bates and Julie Christie up until the recentfilms of ‘The Shell Seekers’, BBC’s Sense and Sensibility’ and BBC’s latest, and brilliant, ‘The Night Manager’ with Tom Hiddleston, Hugh Laurie and Olivia Colman, filmed here in April 2015.
visit the Abbey and gardens at a reduced rate before the main season starts. 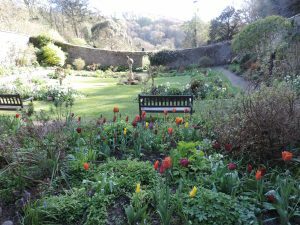 There are lots of lovely flowers appearing in the gardens to herald the start of spring, thank goodness! 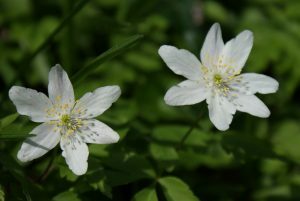 Magnolias, tree rhododendrons, camellias, daffodils and narcissi, scillas, hellebores, wild primroses and even the first bluebell has been spotted a month early. 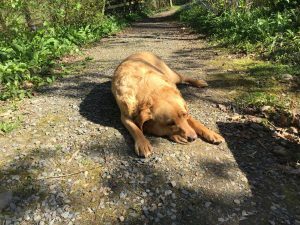 The family Treasure Hunt is always fun and keeps everyone well exercised including the dogs. We then open for the season on Good Friday, with Easter Egg Hunts on Easter Sunday and Monday. The Festival Players; Ratburger by David Walliams, performed by Heartbreak Productions; A Midsummer Night’s Dream performed by Illyria and lastly, The Importance of Being Earnest by Oscar Wilde, performed by Heartbreak. So, hopefully, something for everybody! We welcome back Mr Crackling (Trevor and Emma Shere) with their delicious barbecues and we will have our bar. It was a huge shock and great sadness last summer when Chris and Jill Johns told us they were leaving Hartland Quay Hotel as Managers. They were the third generation of the Johns family to have run the Quay since 1963 when Chris’s grandfather took on the lease of the hotel. 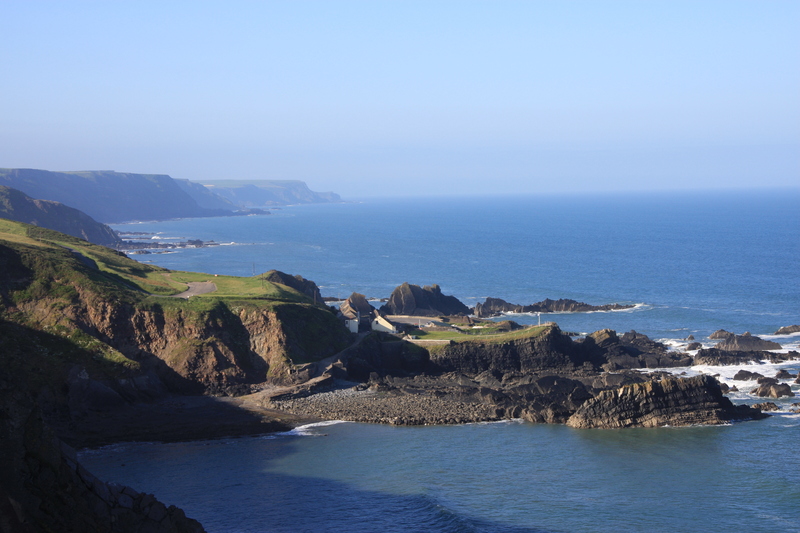 Hartland Quay Hotel is part of the Hartland Abbey Estate. Chris and Jill have done a wonderful job welcoming thousands of guests over the years and have worked extremely hard doing everything from shoreing up the cliff and mending the roof after storms to running a welcoming place to stay, eat and drink. They have been supported by their marvellous and loyal staff. We thank them for all they have done. They will be sorely missed but we are extremely lucky to have Donal and Sarah Stafford taking on as Managers. Donal and Sarah are local to Hartland and have great experience of the hotel trade. Sarah has set up her own successful business running The Old Bakery Coffee Shop in Hartland which will continue to provide welcome refreshment in the Square. We wish both them and Chris and Jill our very best wishes for their futures. up until now but Dave, Nigel and Sam have been working flat out in the gardens while Carol has been wielding the hoover and dusters with gusto! 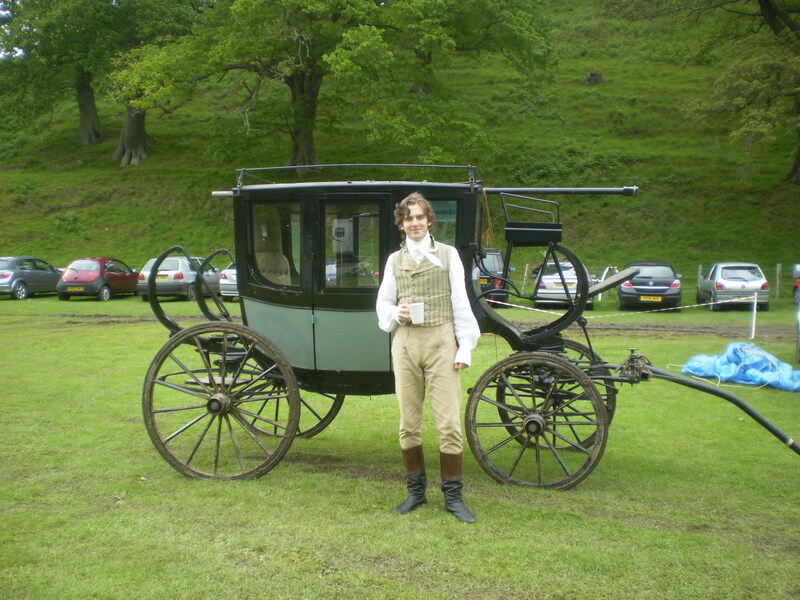 Theresa meanwhile prepares to welcome many coachloads of visitors throughout the summer who will no doubt be well fed and nourished by the wonderful team of Kath and Jo in the tearooms. No-one can resist their delicious cakes and cream teas…. Marjorie, the peahen, looks forward to any crumbs under the table! The donkeys, Becky and Snowdrop, are waiting for the blacksmith to do their feet before returning to Hartland from their overwintering at the farm. We look forward to opening the gates on Sunday 6th and welcoming our visitors for 2016! We thank our wonderful hardworking team here for their support to us. 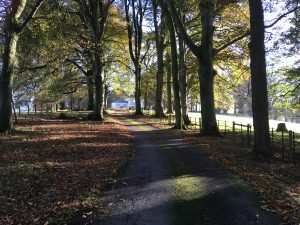 We look forward to welcoming back all our part time house stewards and those who work so hard in the kiosk to welcome our visitors; we miss their company during the winter and are always so pleased to see them back along with new helpers to our close knit team. Finally we hope our 2016 Hartland Abbey leaflet will be popular. In recognition of the huge support given to us by our Dutch visitors year on year we have designed it in the good orange of the national colour of Holland. We hope it will be easily discernible in the leaflet racks! 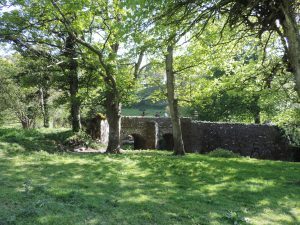 Reading in the newspapers of the demise of the cuckoo in some parts of the country makes me realise how incredibly lucky we are here in the Abbey valley where things have not really changed over the centuries. 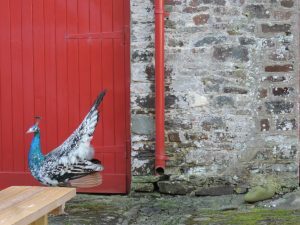 We heard the first cuckoo this year on May 2nd; he may have been cuckooing earlier but that is when we heard him first. It brings real joy when friends return safely; the swallows to their same nests in the Abbey outbuildings and the cuckoo to the valley to join old friends like the woodpeckers who seem to be pecking away all year. 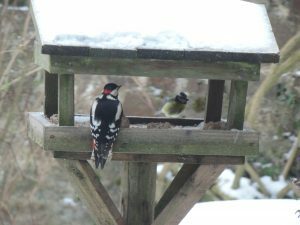 We have a lovely greater spotted woodpecker visiting the bird table every day. In the house and gardens nothing much changes either! Old friends return in the spring to be our wonderful house guides for the new season. Some we will not have seen all winter and it is lovely to catch up again. We are all that bit older! Some things have been in the house since it was built in the 12th century like the old documents which have been here since the Abbey was built and gifted by Lord Dynham almost 900 years ago. Up until this year the last piece of serious furniture to come into the house was the wonderful, segmented table by Jupe which my mother in law so cleverly bought in 1936 for £10 3s 6d and which so impressed His Excellency The Emperor Haile Sellasie when he stayed in the Abbey though he was much more interested in where my father in law kept his prisoners! Our kitchen has remained unchanged since the 1940s! I suppose we are regarded as some sort of freaks nowadays but this is how we like it and we see no reason to change for changes sake. We never throw anything away – an old envelope is always useful! However from the visitors point of view it is always fun to see changes. We have been incredibly fortunate this spring to have been given some wonderful furniture thanks to the generosity of some visitors to the house on the first day of the season. They decided that the Abbey was the perfect place for their beautiful 16thC sword chest and Waterloo chairs which had been in their family for ever. We are hugely grateful; they know who they are and we are forever grateful to them. Extraordinarily at much the same time an old friend of Christine Cobbold ( Stucley), who had happy memories of staying at the Abbey as a young girl in the 1960s, was moving into a smaller house and has given us a beautiful Colefax and Fowler four-poster bed which was too big for their new home. It is a wonderful addition to no 3 bedroom and again we are hugely grateful. 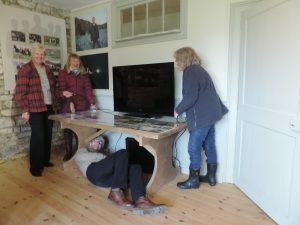 In one week these wonderful gifts have done so much to add to the visitor experience, the first furniture to come into the house for 80 years! We have also had a very emotional homecoming of six photograph albums and diaries from my husband’s great uncle and cousins who spent a great deal of their lives at Hartland Abbey at the beginning of the 20th century. All are dead now but the books are an extraordinary and loving record of a devoted family in those years before and after the First World War. Major Humphrey St Leger Stucley was killed at the first battle of Ypres in October 1914 leaving a widow, Rosie, and two sons, Peter and Lewis. The younger, Lewis, died as a result of wounds at the Battle of Salerno in 1943. Peter became a journalist with the BBC and author; his broadcast on the Home Service just after the war entitled ‘A Devonshire Boyhood’ on his recollections of staying at Hartland Abbey with his great-aunt as a young boy are a beautifully written insight into life in a country house at that time. We intend to exhibit some of these albums and the recollections, in the Abbey in the near future. We have an enormous debt of gratitude to some wonderful people, Ken and Maureen Langford, who were asked to clear a friend’s house in Oxfordshire after she died; they recognised that these were cherished possessions of a family unknown to them. After thorough research Maureen Langford traced our family and reunited these priceless albums to the Stucley family. If it had not been for Mrs Langford they would surely have been taken to the tip and this important link in our family history would have been lost forever. Thank you so very much. No sooner had the furniture arrived than the BBC arrived too! 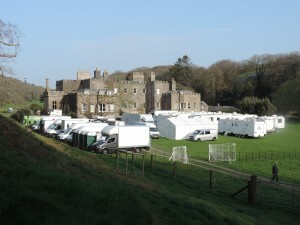 The peace of the valley evaporated as huge articulated lorries rolled in to be production offices, make up, hairdressing, catering and rooms for actors. 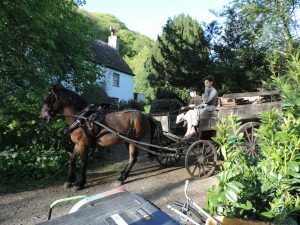 Our car park was the base for the BBC 6 part serial ‘ The Night Manager’, adapted from the John Le Carre spy thriller, and filmed in Hartland and at Blackpool Mill Cottage. It stars Tom Hiddleston, Hugh Laurie and Olivia Colman and will be shown on the BBC in 2016. It was a fantastic week. Everyone worked incredibly hard to get it all done before they pulled out en route to Morocco and Majorca having filmed in London and Switzerland before coming to Hartland Abbey. Our location manager, Steve Hart, was so professional and made it all work so well for everyone. The film crew were all wonderful. We can’t wait to see it on screen. 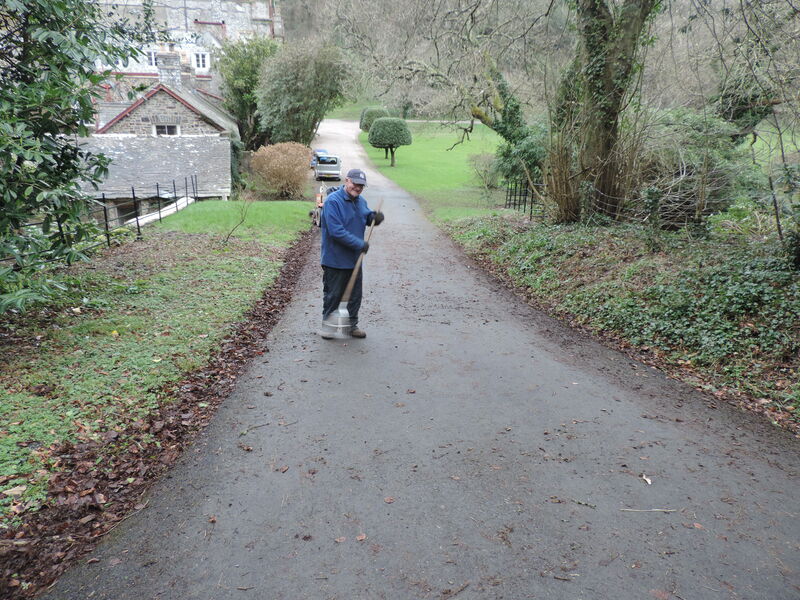 The only hint I can give is that Blackpool Mill will look a lot less clean than it does when Anne gets it ready for our holiday visitors! No more hints….! All this was happening at the same time as the Grand National meeting when I normally give myself three days holiday in front of the teli. As parents in law to a National Hunt jockey it is very difficult to watch without being consumed by nerves but Tom had a wonderful ride in the National on Soll, right up front keeping out of trouble, and finishing eighth. He had had a very good Cheltenham with three winners and a good Aintree winner too which takes off the pressure. The film truckies were all keen betting men who insisted on backing Tom in every race. They went home a lot poorer! 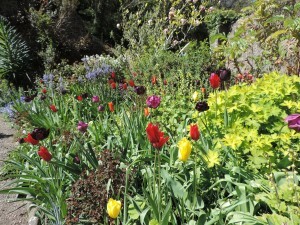 More down to earth, Spring has also been all about tulips. 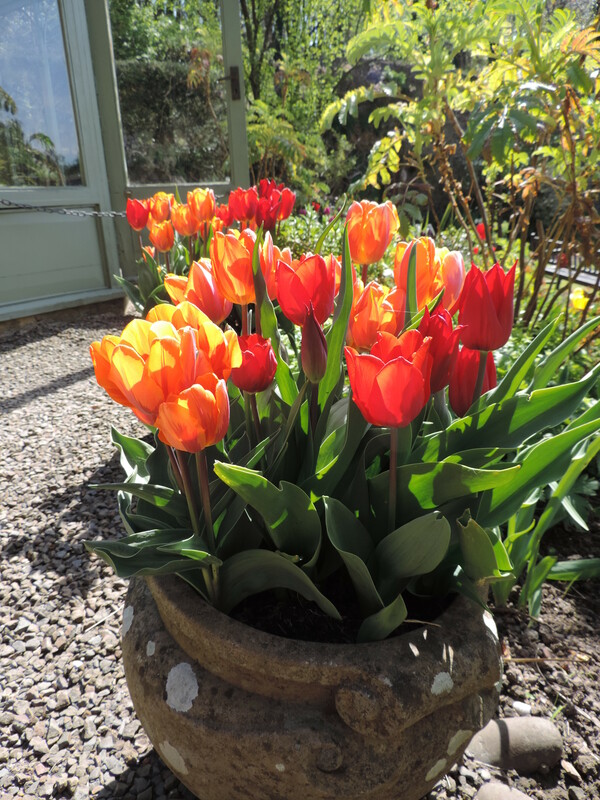 We have had a stunning display of new colours in the pots and borders which are just leaving us. The daffodils and bluebells were very beautiful this year but now the foxgloves are starting to herald early summer which also means weeds in profusion. My arms are stung and scratched after a bank holiday weekend of pulling nettles, docks and brambles! 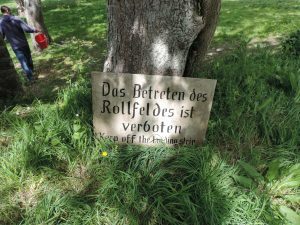 In the wilder parts of the woodland gardens they appear overnight but are not very welcome; there is only one thing to do…! Thank you to everyone who visited us on our special wild flower days and at Easter for our Easter Egg hunts. Theresa’s wonderful clues kept everyone busy all afternoon with the reward of a big Easter Egg. We sailed quite close to the wind as we only had four left over; there would have been some very sad faces had we run out! It will be back next year with more challenging clues. 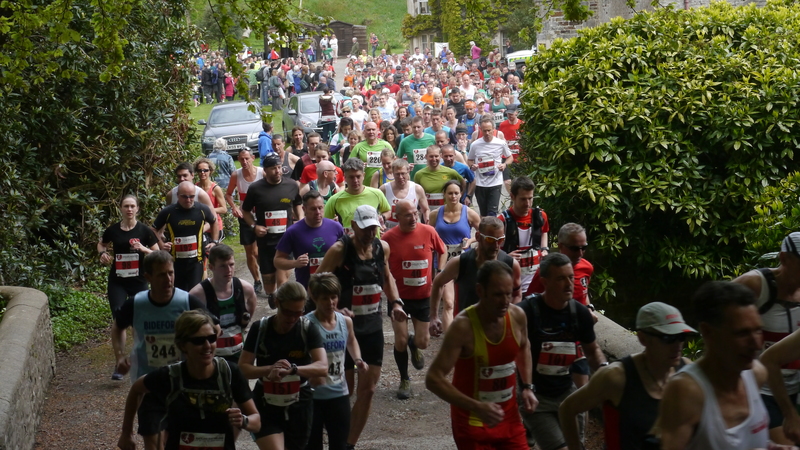 There were 300+ runners for this years gruelling Hartland Hartbreaker Run, so brilliantly organised by Simon Haywood. As yet we have not heard the final amount raised for the Childrens Hospice South West. Already 2016 is booked for Sunday May 1st. 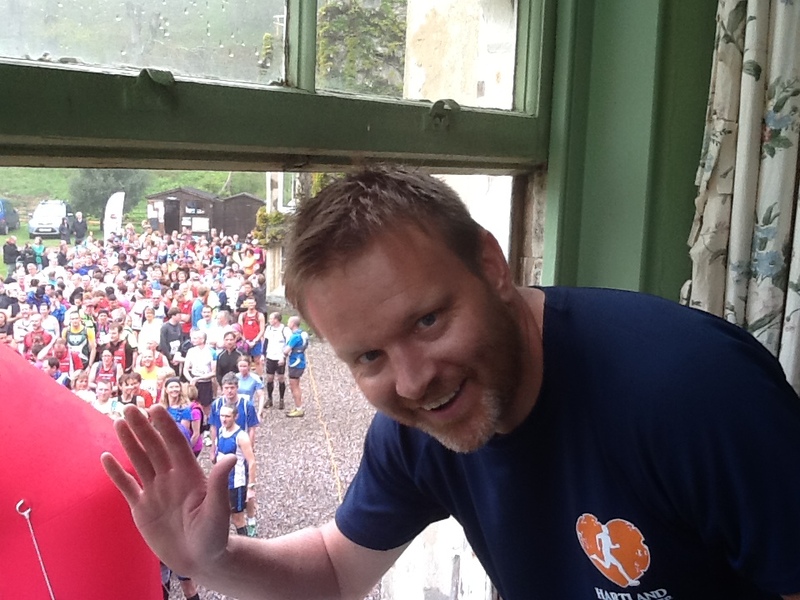 Our thanks to Simon for his dedication to making this event such a huge success. We have just had Christopher Drake, the very brilliant photographer, taking pictures to accompany an article by Janet Gleeson in the BBC magazine Homes and Antiques, for the August edition. It is a great honour to be included in the magazine and we look forward to seeing it in print. 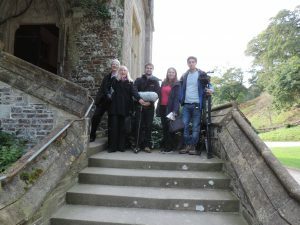 We first met Janet when she stayed at Hartland Abbey as part of the Antiques Roadshow team. She is a brilliant author and one of the best books I have ever read, The Arcanum, about the discovery of Meissen china, was written by her and is a must! 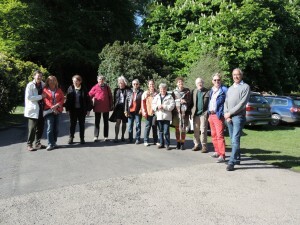 We have just had a group of twenty Germans staying in the house for five days of garden visiting and walking. We were very lucky to have had almost wall to wall sunshine and the coastal walks were looking at their best with all the wildflowers. Each year Jenny Curtis Beard, the founder of Curtis Beard Walks, brings a lovely party to stay and savour the glories of staying in an English country house with less than perfect plumbing! It was a very happy week followed by a wonderful group of the Directors of the Kremlin Museum who visited the Abbey as part of a tour of the Southwest of England. 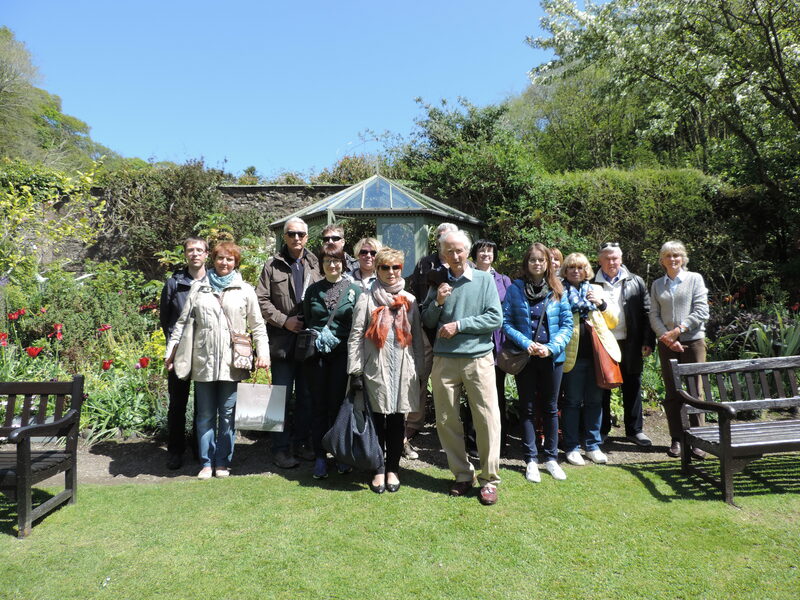 It was a great honour to have had a visit from such an erudite group of Russian people. We have lots of outdoor theatre coming up soon. Starting with ‘The Magnificent Three’, a spaghetti Western by Miracle Theatre who we love, the season includes something for everyone including a Jazz evening with Digby Fairweather to get the Abbey shaking, a Family Arts Day with the Plough Theatre, the disgusting sounding ‘Mr Stink’ from David Walliams until ‘Emma’ by Jane Austen at the end of August. We have a wonderful Charity weekend of fun in aid of the North Devon Hospice and Cancer Research coming up at the end of June. 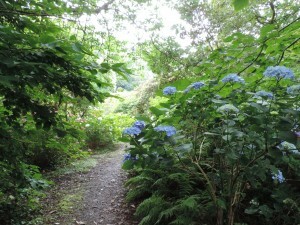 All the details are on www.hartlandabbey.com under Events. 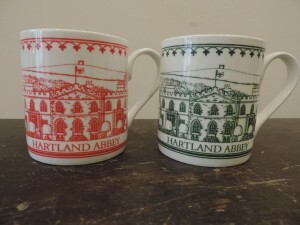 Our wonderful and gifted neighbour and former architect, Brian Percival, has designed our first Hartland Abbey mug for us. We are thrilled with the design and these china mugs are now adding a class act to the Abbey shop! They are available in green and red and are flying off the shelves! Thanks to our fantastic and small team of Theresa, our administrator, Carol, our housekeeper, and Nigel, Dave and Sam our gardeners, Leighton and Richard on maintenance and all our amazing house stewards when we are open, we have achieved a TripAdvisor Certificate of Excellence 2015, for the second year running. Thank you to all of you for putting on such a fabulous experience for our visitors. 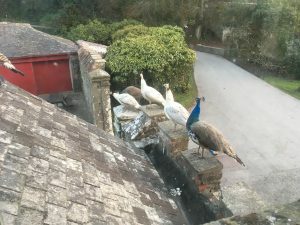 Finally, Marjorie, our rescue white peahen brought to us by the wonderful Diana Lewis of the North Devon Animal Ambulance, is so tame now. She sits on The Little Dining Room windowsill waiting for her toast in the morning. If you are visiting and see Marjorie, please don’t let any children or dogs chase her but do give her a little bit of your cake if you can bear to part with it! She is terribly smelly but absolutely adorable! We are praying she won’t be eaten by a fox or a badger as she is too tame really. As I write the gardens and walks are looking so beautiful. 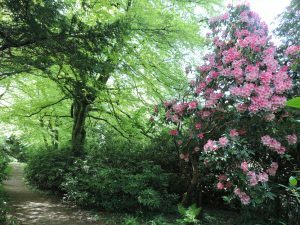 Foxgloves have replaced bluebells in the walks as the season moves on, the rhododendrons and azaleas are flowering in the Shrubbery and Bog Garden and their scent is filling the warmer air as is the wisteria in the walled gardens. 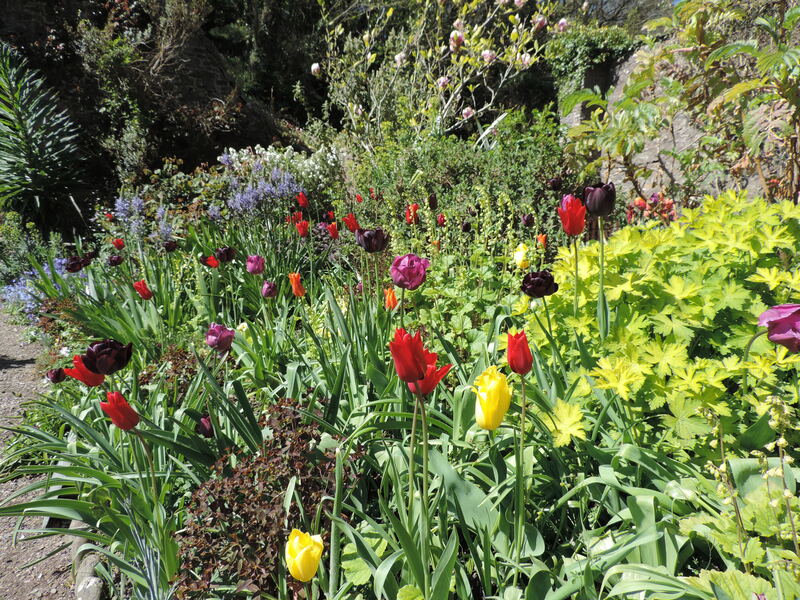 The tulips have faded to be replaced by a burst of herbaceous splendour! My job is to keep pulling up weeds……. It is only a few days now until we open for our 2015 season. The usual last minute panic ensues, as it does every year. 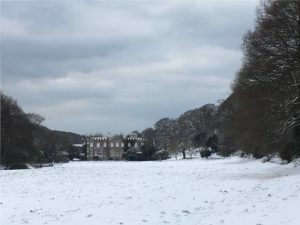 Nothing goes to plan when we are closed and this winter has been no exception with two huge trees falling down in the last month which needed clearing, just as we had tidied the gardens and walks ready for opening! 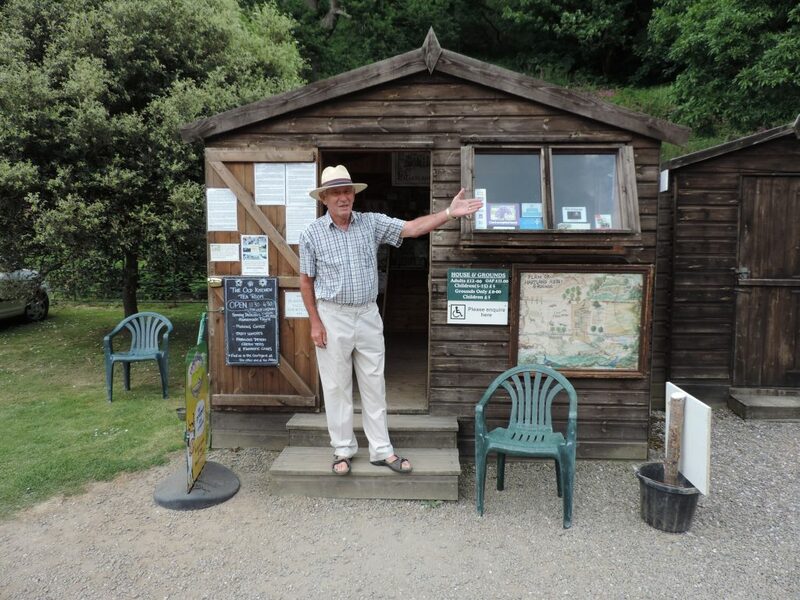 We had been hoping to open a small visitor centre full of information within the house but time has run out. It will be a good job in wet weather and hopefully it might be opened later this year in what was an old staff bedroom. We are also hoping to have a short(ish) film of the life of the naughty Sir Thomas Stucley, an 16th Century ancestor, which is being made by Sir Hugh’s cousin, Professor David Northmore. It promises to be very exciting and probably quite bloodthirsty seeing he was such an old devil! Carol has been dusting and polishing and hoovering up flies, Theresa taking lots of bookings and making wonderful new notices, Nigel, Sam and Dave trying to get the garden looking its best, Leighton mending everything and we have been beavering away in the background trying to create our new website and dealing with the ever increasing mountains of paperwork! 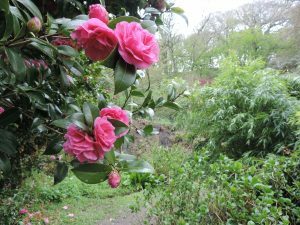 An enormous oak tree fell across the part of the Bog Garden where some of our loveliest camellias grow, smashing them to the ground. 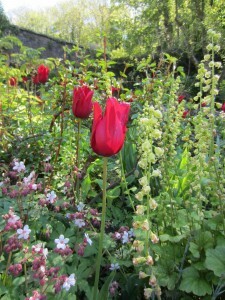 Whereas this will not do them any harm, as we get older we will miss them until they flower again in a few years time. Camellias rather relish being cut back but take a few years to flower again. This oak tree, probably 250 years old, was not rotten at all but just pulled over by its huge weight. 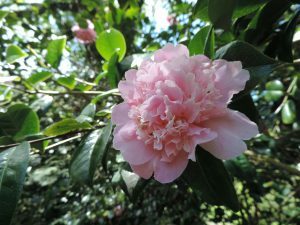 However there is no shortage of camellias at Hartland Abbey and we have lots of photographs to remind us of their beauty. 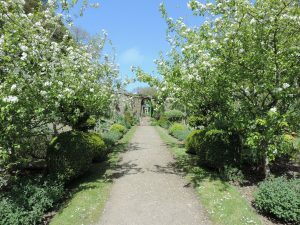 The saddest of all has been the loss of the old Mulberry tree in the bottom of the Walled Gardens, just inside the yew topiary. For hundreds of years it had been producing delicious, juicy mulberries; the grandchildren called it the ‘Juice Tree’ on account of the squishy berries which they loved! Their faces were black by the time they had finished. It is always so sad losing any tree, let alone a loved one. We have immediately planted another mulberry which we hope will bear fruit in our lifetime! 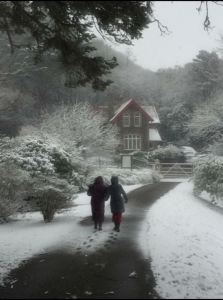 This winter we have achieved some definite improvements to the visitor experience! 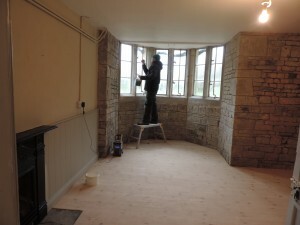 The walls in the Tea Room were always damp, typical of an old building. Leighton has tongue and grooved the walls and it has immediately improved, not only the appearance, but the warmth! Kath and Jo provide such wonderful lunches and cream teas for everyone so it is nice to do something for them. They are planning delicious Easter treats! The front drive was becoming very bumpy. 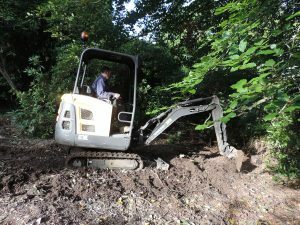 Last year we resurfaced the back drive, this year we have had to fork out again, not something we were longing to do at all! Up until now it was the old stone carriage drive, put in about 250 years ago, but sadly now worn out from so many cars. However it was necessary for our visitors to arrive safely and happily. This is an example of a substantial hidden cost caused by the amount of traffic visiting the Abbey; in the old days there were few cars, and few carriages before that. However we are grateful for every visitor. Without you we would not be able to keep the old place going. Thank you! 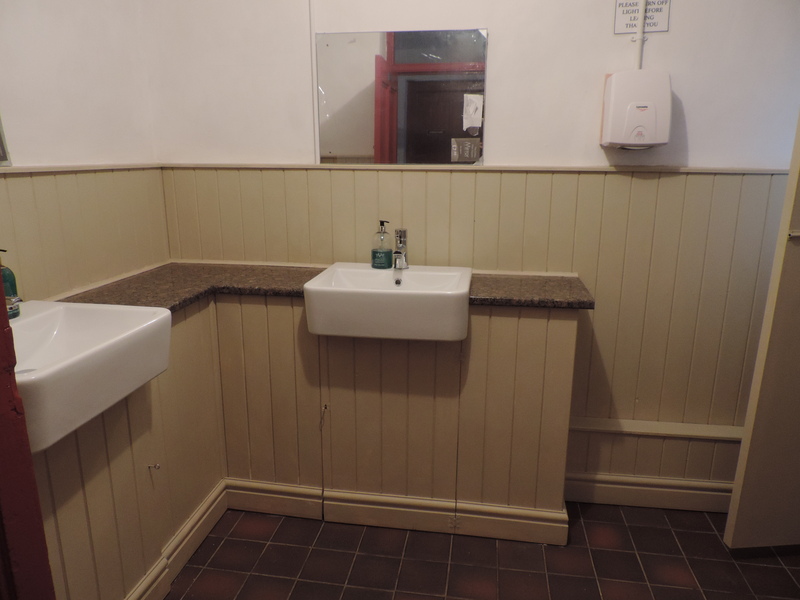 The most important (and necessary) improvement is the new ladies’ loos! We have NEVER had hot water, something most of us come to expect in the 21st century! There was only one washbasin and the loo handles were forever breaking off! Thanks to Leighton and Dave we have modern flushers, two washbasins AND hot water! This should particularly help lessen the queues for coach parties, and theatre goers when 300 people need the loo in a 15 minute interval! 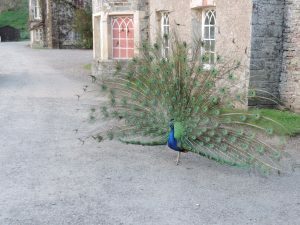 Lastly we have created our new website www.hartlandabbey.com , something that was necessary to be compatible with advances in new technology. We are very happy with it but it took weeks to achieve the end result. Hopefully it will be easy to glean the information you require. 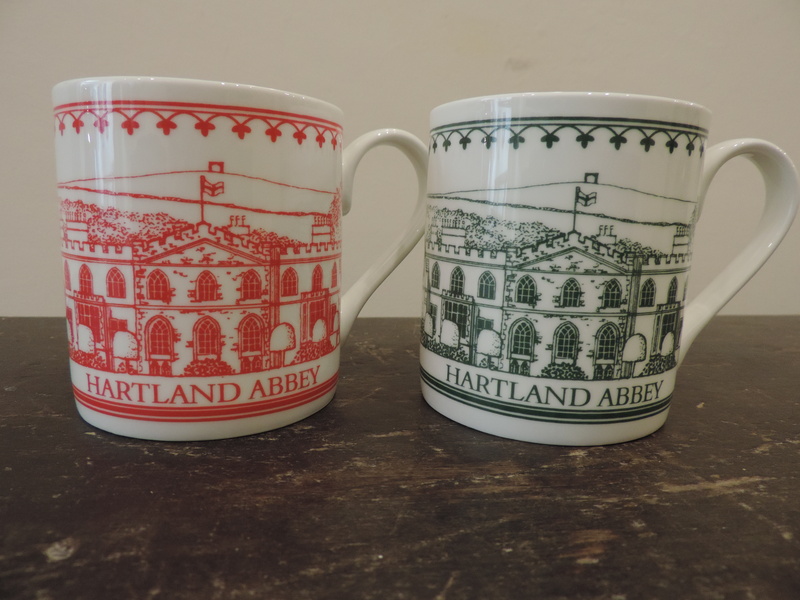 We are producing our first Hartland Abbey mugs which will be on sale very soon. 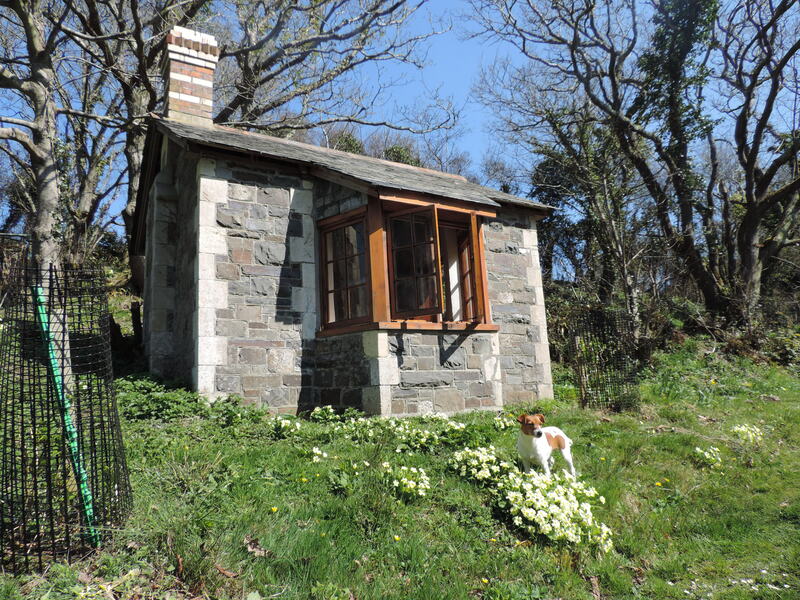 The design was by our very good friend and architect Brian Percival whose wife, Wendy, writes very good and exciting novels, on sale at Hartland Quay! 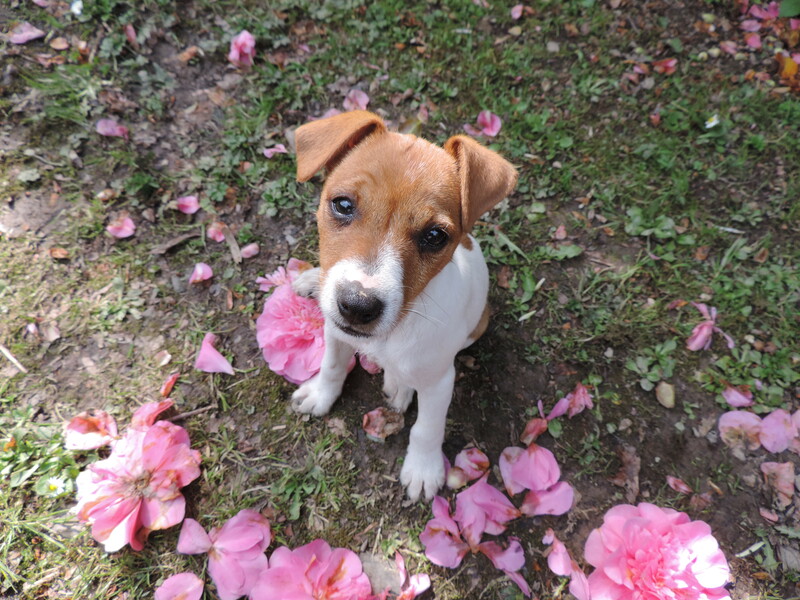 Very sadly Alice, our adored Jack Russell, was killed on the road. It was absolutely heartbreaking. 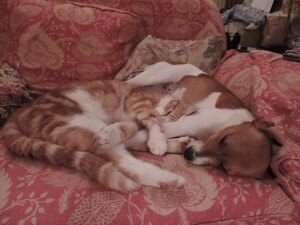 But every cloud has a silver lining and now Rosie rules the roost. She is now a year old, doesn’t bite, is loved by us all but has got it in for our lovely new peahen, the peacocks, the guinea fowl, the cockerels and the black sheep! 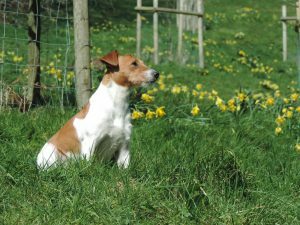 Trying to stop her chasing them is almost impossible as terriers are very selectively deaf! The walls in the vegetable garden were in an awful state so this time last year we had a team in to repair them and they do look much better. Sadly there wasn’t enough in the kitty to repair them all but at least it is a start and has stopped the worst falling down completely. We had lots of events including the very popular and gruelling Hartland Hartbreaker Run which is being held again in May this year and a wonderful season of outdoor theatre and this year promises some very special performances from Mr. Stink and a Family Arts Day for children to some good Gilbert and Sullivan with ‘Iolanthe’, Jane Austen’s ‘Emma’ and much more and an evening of Jazz with Digby Fairweather’s Half Dozen and Tina May. 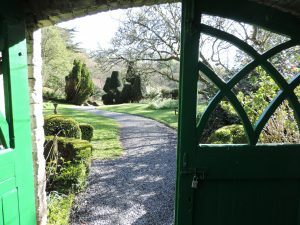 All details are on our website www.hartlandabbey.com. 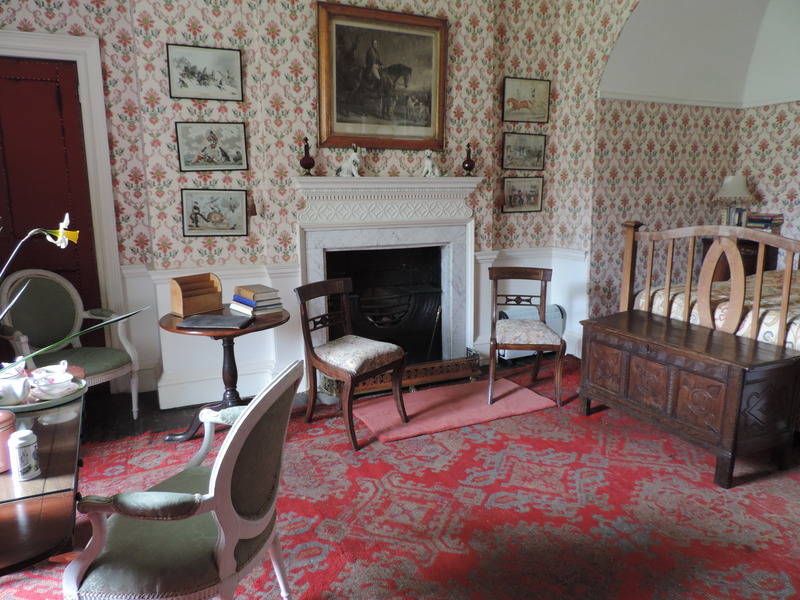 The Willian Stukeley exhibition continues and is to become a permanent feature in the house as there is such a strong connection to this family. He was a fascinating character who achieved so much in his lifetime, long before modern technology and modern communications. 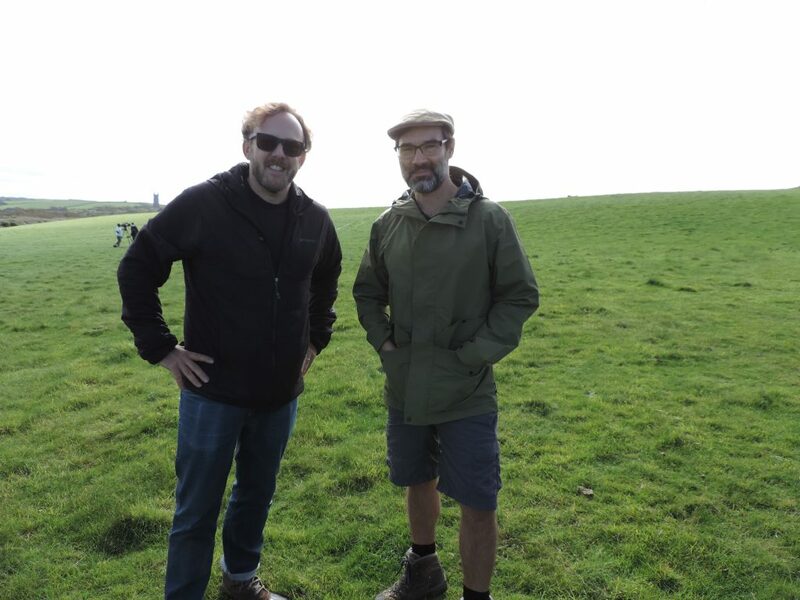 His involvement in Stonehenge and Avebury is very topical considering how much time is spent visiting these ancient places, and their history, on the television. 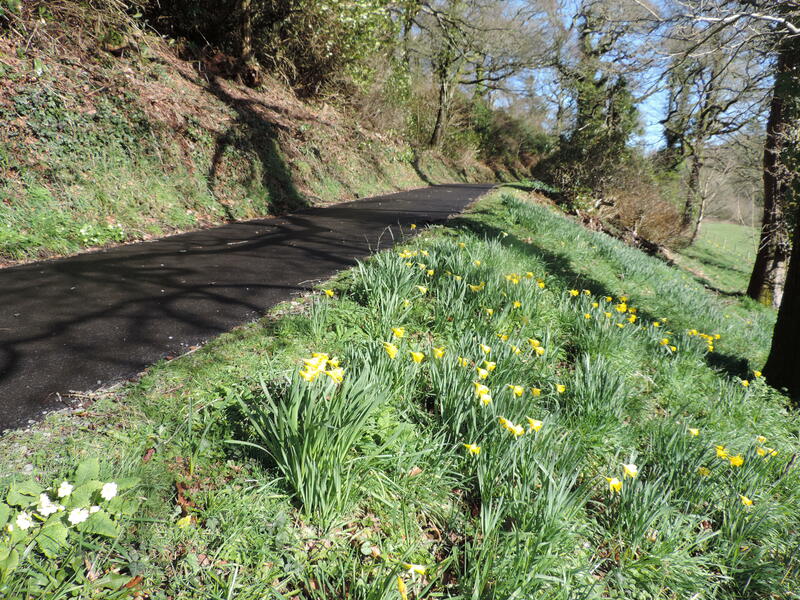 We had our Daffodil Day on 15th March. It was a lovely day and thank you to everyone who came and the very special dogs! 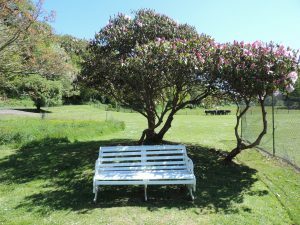 The daffodils were very reluctant to appear on time but plenty of camellias and the most wonderful mimosas were flowering profusely. 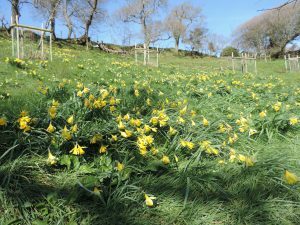 It does mean that the daffodils will be at their best at Easter as well as the magnolias and lots of beautiful spring flowers. 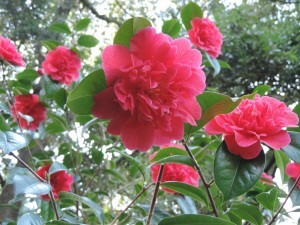 The camellias are fantastic this year. 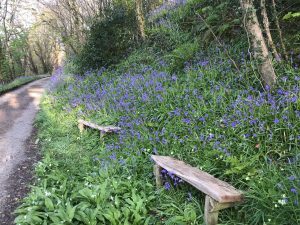 We have two Bluebell Days at the end of April when the valley turns blue. 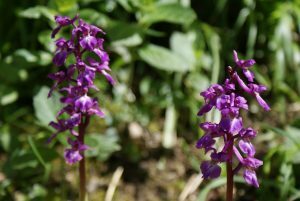 It is a wonderful time with the wild orchids and foxgloves appearing too. This year we have new plantings of tulips in the Walled Gardens and pots which we hope will look stunning. Some are already in bud but later in April and May they should be spectacular. The grandchildren are all growing fast. We just love it when we can all be together at times like Christmas and Easter. Our son in law, Tom Scudamore, who is a National Hunt jockey has had a very good season so far with two winners at the Cheltenham Festival but we are always mindful of the falls ahead in this most precarious of jobs. Our other son in law, Ran Morgan, who runs Knight Frank in Edinburgh has had a terrible fall in a cross country race and has broken his hand, his wrist, his ribs and his collar bone all in one go. And all in the name of fun…. We have a few available weeks in the holiday cottages. We will always do a reduction for couples as although they both sleep eight people, they are cosy and very good for two people. 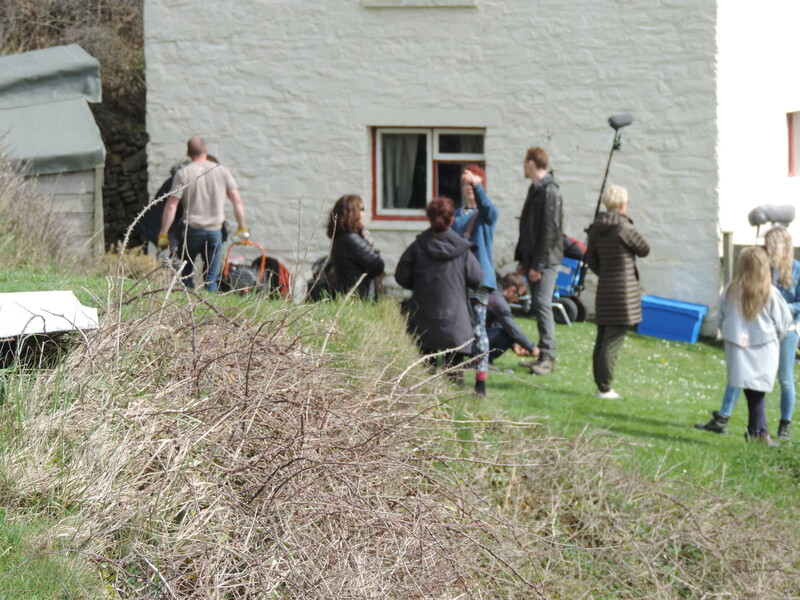 We are very hopeful that the BBC is coming here to film part of a six part drama series for TV, and we have the possibility of a three day festival in summer. So there is plenty to keep us busy…. and a lot of people running each property, we are a private, family house without the funds to employ lots of people. We appreciate hugely the many, many kind remarks written in our comments book by thousands of our visitors each year but are saddened when a very small minority write derogatory comments on Trip Advisor. We would really appreciate it if you were to come and tell us or our staff what is wrong so that we can hopefully put it right!